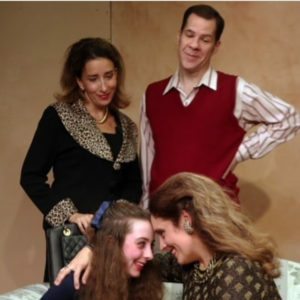 Maura Dubuque, left, performing in “The Gingerbread Lady” at the Albany Civic Theater. 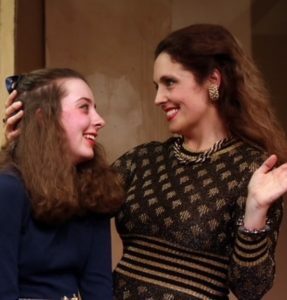 Columbia freshman Maura Dubuque is currently performing in the Albany Civic Theater production of “The Gingerbread Lady.” Ms. Dubuque plays the main character’s daughter, Polly Meara, in this dark drama written by Neil Simon. We sat down with Ms. Dubuque to discuss the play and her passion for acting. Q: What is this play about? A: The show is about a retired cabaret singer who was an alcoholic and just got out of rehab and is trying to piece her life back together. Her teenage daughter moves in and she’s trying to plan a friend’s birthday party but then something happens and she falls off the wagon again. Q: How did this role come about for you? A: My mom saw the auditions on a casting call website so we just went over and I auditioned. It was really fun. A: It’s going really well. The audiences are amazing. It’s really cool. Q: Is it new for you to be acting alongside adults in a play? A: Yeah, I’ve never really worked with adults but they’ve all been really supportive and they are amazing actors. It’s been awesome to work with them. Q: What is your favorite part of performing in this play? A: When I go out to bow and everyone cheers. It feels really nice that people appreciate the work that we put into this. Q: Is acting and performing something you want to keep doing after high school? A: Definitely. I would love to keep doing theater. Q: So it’s a passion of yours? A: I’ve been doing this my whole life so it’s something I’d like to continue doing.